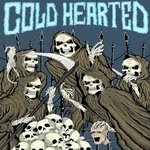 Life To Live to release Cold Hearted 7"
Life To Live Records will release new 7" ep by Cold Hearted. The label has published the artwork for the release. Chad Lawson did the drawing, Javi did coloring. 7" should be out soon.